A weekend of astrology, yoga, group and private sessions. 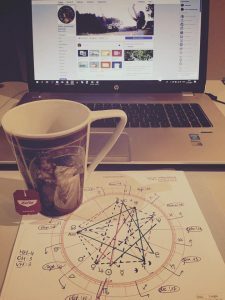 Nele Costers from Adara.be will host an introductory weekend to the basic concepts of astrology. She will highlight the most important transits that happen today and illustrate how they affect people’s individual charts. For this, participants need to know their place and time of birth. The weekend will cost €295 which includes accommodation, food, yoga and group sessions from Friday evening until Sunday lunchtime. Individual sessions will be available on the preceding Wednesday and Thursday but are limited to 3 people per day. Sessions cost €75 and last approximately 90 mins. Contact Marlene for booking. Nele Costers is a professional astrologist since 2009, and coach & mindfulness trainer. She has supported people through astrology for over 20 years. She believes in simple, clear and concrete language about astrology for more insight into your own psyche, and that of others. She is based in Dendermonde, Belgium. She believes her positive approach provides clarity and overview, and often gives her clients the extra decision-making capability required to make wise decisions, to set changes in motion or to find calm and peace of mind again. supplemented with examples and exercises in small groups based on your own horoscope and those of others to learn the ‘story’ in the combination of the celestial body in a sign and a house. be excited to continue playing and experimenting with your new knowledge in the principles of astrology.